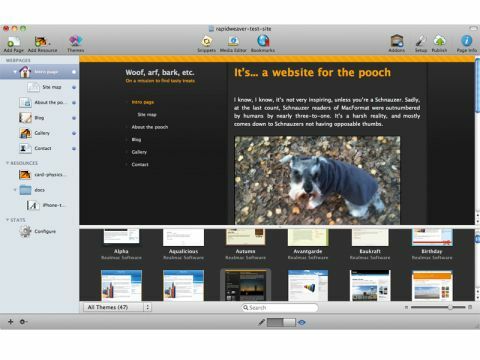 With iWeb seemingly mothballed by Apple and few other companies stepping up to the plate, Realmac had a great chance to blow people away with RapidWeaver 5. While the company hasn't dropped the ball, this update represents a fumble. The good news is that RapidWeaver remains a usable, straightforward product for building your own websites, with enough extensibility to cater for anyone making tentative steps towards hand coding. Throughout the application, the interface is logical, looks good and has been polished a little since the previous version; there's a useful new projects window and a noticeable speed boost, for example. There are also new features, including a bookmarks manager for storing webhost connection details, site-map creation (both HTML and XML), and support for Safari's Web Developer Tools and Google Analytics (the former of which seemingly requires activation in RapidWeaver's preferences, but beats the native source viewer by a mile). One of the trumpeted new features, Site Resources, is a bit more creaky, however. It enables you to store elements such as PDFs in the sidebar for later linkage. RapidWeaver helpfully keeps an eye on their local location should you move things about, and it correctly uploads everything to a resources folder on your live site. But despite its helpfulness in this regard, the application seems unnecessarily fussy when it comes to the type of documents you can drop on the sidebar, and was only reliable when using the Add Resource button. Elsewhere, RapidWeaver 5 proves to be a somewhat disappointing update, largely regarding the process of making web pages. Galleries remain fiddly to create and are visually mediocre when viewed in the browser. The split between content editing and visual preview is irksome and dated, especially when Edit Mode doesn't even attempt to differentiate differently styled text; for example, various levels of headings are all merely highlighted in green. At the very least, we by now hoped to see the option for a live preview alongside Edit Mode. And for all Realmac's crowing about adherence to good code, it's intensely annoying that web-page text isn't automatically wrapped in paragraph tags – you instead must do this manually or have your code full of line breaks. On the plus side, this latest version consolidates CSS, which slightly speeds up outputted sites. Slow to progress RapidWeaver 5 falls short of our expectations. The majority of the changes are incremental rather than revolutionary, and most of the application's shortcomings remain. Also, when companies increasingly offer single-button WordPress installs as standard with even cheap hosting plans, it's tough to recommend a £50 application that offers relatively few advantages over a modern free blogging system. RapidWeaver hovers in that uncertain limbo between competent introductory application and out-of-date, restrictive software solution. For anyone who absolutely must have a Mac-based web design capability and work on sites locally rather than in the browser, RapidWeaver's still the best bet for novices (although if you've already got RapidWeaver 4, we'd question you splashing out $39 – £25 – on upgrading). But this is an underwhelming update and we were hoping for more.